I didn’t want to watch Clean with Passion for now (let’s call it “Drama” from now on) at first because, I’ll be really honest, the pairing is a bit off for me. “But they have Song Jae Rim let’s give it a try!”, I thought. So I gave it a try and loved the first few episodes. Unfortunately, as you can tell from this post title, I dropped Drama after watching the 9th episode. Despite the hype it has both in domestic and international community, despite the cute Kim Yoo Jung¸despite my love Song Jae Rim is in it, I had to drop Drama. Yoon Kyun Sang plays as Jang Sun Gyeol and Kim Yoo Jung plays as Gil O Sol. The second lead is Song Jae Rim’s character, Daniel Choi. 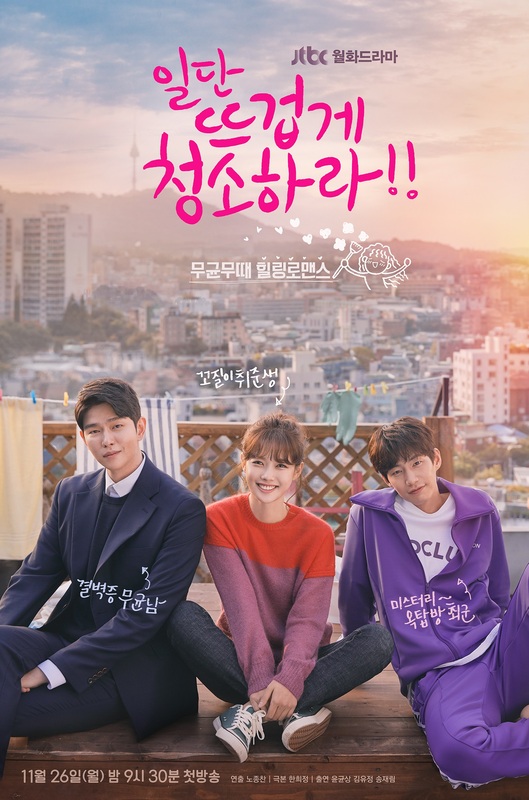 Your typical rom-com drama, Jang Sun Gyeol falls in love with Gil O Sol, Daniel Choi falls in love with Gil O Sol too but Gil O Sol only loves Jang Sun Gyeol. Basically you know how the plot will turn out when you pick up the first episode. 1. The side characters’ stories are pretty irrelevant and do not add much value to the plot as a whole. For example, Young Sik’s pitiful love story. What for? Another one is Dong Hyun’s criminal record. It’s revealed that Dong Hyun has criminal record and Sun Gyeol also knows it but still accepts him as Cleaning Fairy worker. Ok, maybe how he got that criminal record and why Sun Gyeol still accepts him as his worker, will be revealed in the later episodes. But why? What for? He’s just a side character, it’s best to reveal everything about him in one go. Toh, the character doesn’t have any significant weight to the story. 2. The story is cute and all, but it’s also lazy at the same time. I legit survived watching until the 9th episode because of Song Jae Rim. The pace is not too slow actually. But in every episode I always feel like they can actually do better, from dialogues to story. I always feel like something is lacking. Maybe because of that too I do not feel encouraged to watch the next episode. Also, my fangirl soul aside, the second lead airtime is too short don’t you think? Daniel Choi feels like just like the other side characters at this rate when in fact he’s the second lead. Then, why bother putting him on the promotional poster if you’re downgrading his role like that? Now the acting department. Overall, Drama has great lineup cast, Kim Yoo Jung, Yoon Kyun Sang, Song Jae Rim, Kim Won Hae, Kim Hye Eun, etc. You can trust their acting, always. The side casts are also great at acting. But I gotta point it out, that Kim Yoo Jung and Yoon Kyun Sang do not have chemistry that draws me in. I don’t feel butterflies watching them together which is one big flaw for a romance drama. Maybe it is only me who feels this way. I see many twitter residences rave about Drama and OTP. My sister is also a Drama loyal viewer and OTP loyal supporter. Individually, Kim Yoo Jung and Yoon Kyun Sang are bursting with charms but when being paired up together they just don’t match. Because of the height difference? No. actually I find their height difference really cute. But because I seriously feel like one of them is a miscast. The age difference is apparently very apparent. And it feels weird for me especially with Yoon Kyun Sang’s body built. Kim Yoo Jung looks like his niece. Trust me I do not want to say that. The casting could have been better. Either their they chose an older actress for Gil O Sol role if they wanted to keep Yoon Kyun Sang and Song Jae Rim or chose younger actors for first male lead and second male lead role if they were to keep Kim Yoo Jung. It’s one or the other. But the casting director kept them three fully knowing it could be awkward from time to time. It is a pity, really. Even though the leads, Kim Yoo Jung and Yoon Kyun Sang, are great at acting it is still a turn off, for me, from time to time. I actually adore them individually. But, I’ll be really really honest here, they do not match together. The OST! I gotta say I love GWSN’s Oh Lady, Go Lady song! One cute song make sure to listen to it! The whole plot feels like a rant but believe me this post is written as objectively as I can. It’s one cute and light drama to kill time but it’s you regular rom-com so expect nothing but a rom-com plot. As I say earlier, you can predict the ending right off the bat. But if yo’re an avid rom-com lover, you might highly enjoy Drama. After all, enjoyable and unenjoyable dramas all come down to each viewer’s preference.